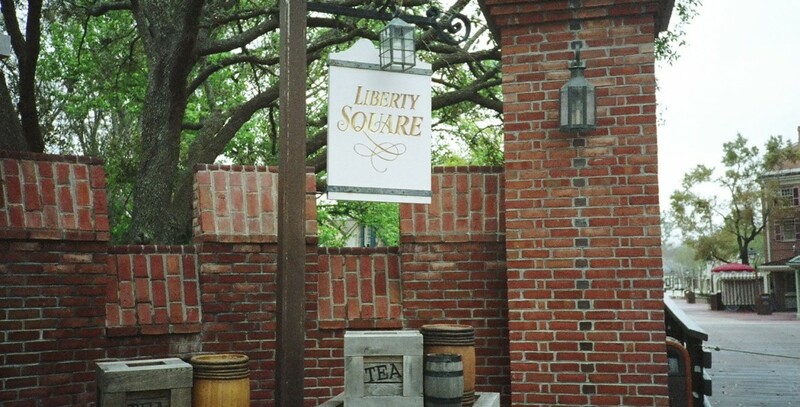 Liberty Square Area in Magic Kingdom Park at Walt Disney World, where The Hall of Presidents and The Haunted Mansion are located. As in Disney’s movie, Johnny Tremain, there is a liberty tree, with lanterns hanging from its branches. The patriots did the same after they dumped the tea in Boston harbor. The majestic 135-year-old live oak was actually transplanted from another area of the Walt Disney World property, a major feat when you consider that the full-grown tree weighed about 35 tons. But, the Disney designers knew that a sapling simply would not do, so they posed to the landscaping engineers the most difficult task they were ever asked to accomplish.